It is very easy and quick to prepare and, as ever, there are very few measurements! Clove of garlic, finely chopped - lots of fine chopping here! Right, first chop the onion and gently fry in olive oil in a shallow lidded pan until the onion starts to go soft and translucent. Add the finely chopped red pepper and the chopped garlic and stir. Remove these ingredients with a slotted spoon and set aside. Cut the chicken breasts into chunks of about 1” cubed and add these to the pan to brown. I season with some salt and a sprinkling of sweet paprika; you can also add some ground black pepper according to taste. Only add a handful of chicken chunks to the pan each time otherwise they take an age to brown. Once they get a slight colour, remove and brown the next batch. 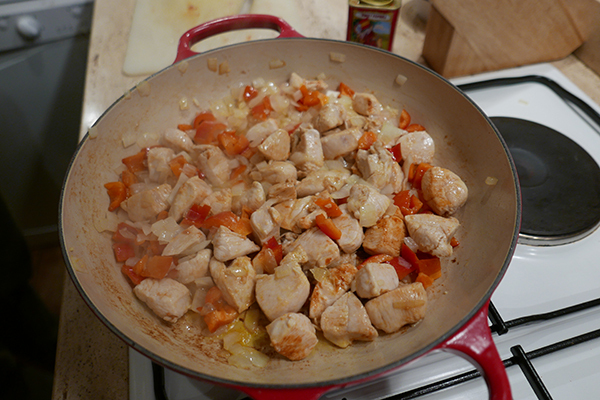 Once all the cubes have been browned, add the chicken, onion, pepper and garlic back into the pan and stir. Pour in equal measures of white wine and orange juice until the level of liquid comes to just below the top layer of chicken chunks. Dissolve a chicken stock cube in a small quantity of boiling water and add this and a bay leaf to the pan and then put the lid on; simmer gently for about 15 - 20 minutes. Don’t be tempted to overcook the chicken or it will go tough. After 20 minutes, taste the sauce and adjust seasoning. If the orange juice is quite sharp, a teaspoon of honey will temper that a little. Once the chicken chunks are tender and soft, you need to thicken the sauce. You can use a teaspoon or two of cornflour mixed with water, or 2 desert spoons of flour mixed with water. Stir this into the sauce in the pan and mix thoroughly, bringing it back to simmering point. The sauce will look quite thick at this stage but don’t worry! Once the thickening agent has cooked (2-3 minutes), add two desert spoons of creme fraiche and stir in thoroughly. Heat the mix through, and it is now ready to serve! This is best served with rice, and we love the rice with wild rice mixed in - it has a great bite to it.